We all know that chalkboards have been super popular lately. I finally decided to try my hand at making one. Last year I found the perfect frame for a chalkboard, but I tucked it away. I'm not sure what this was in a previous life. I thought it may have been a perpetual wall calendar, but I really do not have a clue. where a chalkboard could easily slide into. there is also a groove on the bottom piece that would be perfect to hold chalk. I've been afraid to try chalkboard paint. I tried the spray can kind last year and could not get an even coat to save my life. So this time, I moved on to the brush on kind and I love it. I cut a piece of thin wood to fit inside of the frame and I gave it three coats of chalkboard paint. I allowed a day for drying in between each coat. (that's what the directions said to do) While that was drying the first day, I removed the backing from the frame, then sanded and painted it white. I distressed the frame and gave it a protective matte finish. 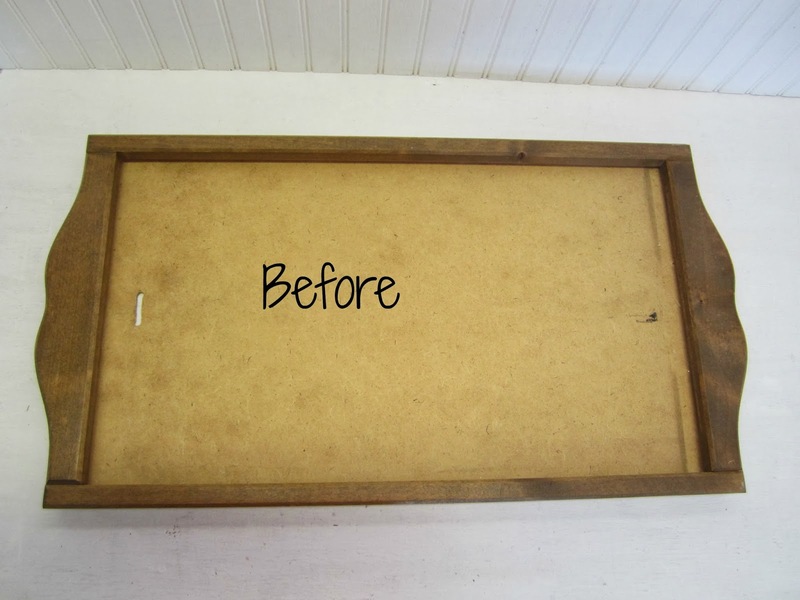 On the third day, I placed the chalkboard in the frame and replaced the backing. use the brush on chalkboard paint again! 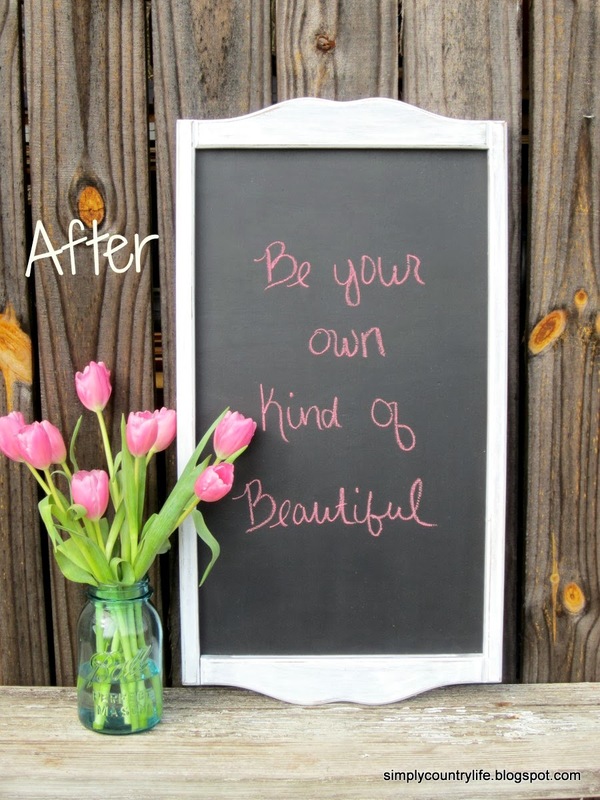 Have you made a chalkboard? or do you use the brush on kind? I'm curious to hear your opinion. Your chalkboard looks great! I love making all kinds of chalkboards. I have always used the brush on kind but when I made some beverage tags I bought the spray paint. I loved how it looked - so smooth. And it was easy. I still use the brush on most of the time, but have gotten quite good at getting it perfectly smooth using a foam brush, doing many very light coats. Thanks Gail, I'l have to try the spray paint kind on smaller projects. Looking good. Two years ago, for our niece's birthday, I refinished and refurbished a family "heirloom" chalkboard that had hung in home that my husband grew up in. Refinishing the wood was the easy part. I decided to try to do a magnetized chalkboard since our niece was only turning one. I purchased a quart of magnetic paint, stirred it until I thought my arm was going to fall off. I put three coats of the magnetic paint on the board, letting it dry throughly between coats, then applied two coats of chalkboard paint. The chalkboard paint worked great. The magnetic paint…not so much. But the gift was a hit and my sister-in-law was thrilled that a piece of family history was restored for another generation! How sweet of you Ellen to pass down an heirloom piece that can be used again. I love pieces that have history, especially a personal one. Thanks for sharing your experience with magnetic paint. I havent' tried it yet. I have not made a chalk board. I have wanted to and love the ones I see on Pinterest. Yours turned out great and I adore the saying. I just saw your Etsy mini on your sidebar with that enamelware pot. I'm off to check it out! Thank you so much for Ann for taking time to stop by today and for checking out my Etsy shop! I'm thrilled. Thanks Megan, heading over to check out yur pinboard now!